Glaucoma affects people of all ages and is the leading cause of blindness in the world. Glaucoma is a disease in your eye that damages your optic nerve. To put it simply, the white fluid that keeps your eye healthy is unable to properly drain and causes pressure to build, which can result in blindness. Chronic glaucoma is often called “the silent thief of sight” because you have no warning sign, no hint that anything is wrong. Glaucoma gradually reduces your peripheral vision, but by the time you notice it, permanent damage has already occurred and you will only be able to see objects that are straight ahead. An acute attack of narrow-angle glaucoma produces sudden symptoms such as eye pain, headaches, halos around lights, dilated pupils, vision loss, red eyes, nausea and vomiting. These signs may last for a few hours, then return again for another round. Each attack takes with it part of your field of vision. Other symptoms include headaches, blurred vision, difficulty adapting to darkness, or halos around lights. Chronic glaucoma normally develops after age 35. Recovery usually occurs on an outpatient basis. Follow-up appointments to ensure you are healing properly are scheduled for the day after surgery, one week and fifteen days. A Laser peripheral iridotomy (PI) is performed almost exclusively for patients with narrow angles , narrow angle glaucoma, or acute angle closure glaucoma . Aqueous fluid is made in the ciliary body of the eye, which is anatomically situated behind the iris . The aqueous fluid primarily escapes the eye by flowing between the lens and iris of the eye, and then drains via the trabecular meshwork , which is located in the angle of the eye (where the front clear cornea meets the iris, essentially). If the flow of aqueous fluid to the drainage angle (trabecular meshwork) is obstructed by a forwardly bowed iris, the patient is said to have narrow angles. This condition may predispose one to an acute episode of angle closure glaucoma. 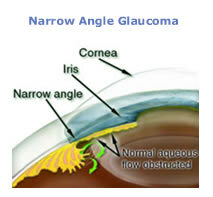 If the angles are never acutely closed, but glaucoma is still present, the patient is diagnosed with narrow angle glaucoma. Laser peripheral iridotomy involves creating a tiny opening in the peripheral iris, allowing aqueous fluid to flow from behind the iris directly to the anterior chamber of the eye. This typically results in resolution of the forwardly bowed iris and thereby an opening up of the angle of the eye. The narrow or closed angle thus becomes an open angle! 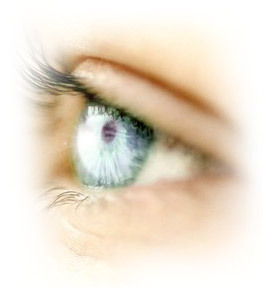 The laser peripheral iridotomy procedure is usually completed in the office or as a brief outpatient procedure. Prior to the procedure, the pupil is often constricted with an eye drop medication known as pilocarpine. The procedure itself is completed with the patient seated at the laser, and requires no sedation. Usually, a lens is placed on the eye after topical anesthetic drops are applied to better control the laser beam. The entire procedure only takes a few minutes. The lens is then removed from the eye, and vision will quickly return to normal. After the procedure, your eye surgeon may recommend anti-inflammatory eye drop medications for the next few days. A post-op visit will be scheduled. Does an ALT Procedure Reverse Glaucoma? Is it Always Effective? In general, glaucoma is not reversed, or cured, by any procedure or medication. However, an ALT often works like a powerful medication, in terms of pressure reduction, without the potential side effects of medicines. Therefore, it may be used alone or in combination with medicines to treat glaucoma. The procedure isn't always effective, although it will be effective in pressure reduction in the great majority of cases. Does the Pressure Lowering Effect with an ALT last a Lifetime? In most cases, the pressure lowering effect with an ALT will last 3 to 5 years. If the initial treatment is effective, a second ALT, in which the opposite half of the trabecular meshwork is treated, may be appropriate. Are there any Complications with an ALT? The risks with an ALT procedure are rare, and when they do occur, are even more rarely serious. In general, the risks include post-operative inflammation, pressure spikes, and worsening of glaucoma. The latter complication is likely to be due to the underlying disease, and not the ALT procedure itself. Is an ALT Procedure More Likely to be Helpful for Certain Types of Glaucoma? Yes. ALT seems to work best in patients with primary open angle glaucoma , pseudoexfoliation (exfoliation) syndrome , and pigmentary dispersion syndrome (pigmentary dispersion glaucoma). It is also likely to be more efficient for patients who have significant pigmentation in the trabecular meshwork. This latter characteristic is determined by the ophthalmologist when examining the angle of the eye, in a diagnostic procedure called gonioscopy. 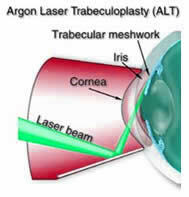 Argon laser trabeculoplasty (ALT) is a procedure which has been proven to be efficient for different types of glaucoma. The procedure has been used for many years and continues to be a powerful tool in for the treatment of glaucoma . ALT is often recommended when medical therapy alone is insufficient in controlling pressure and the progression of glaucoma. However, it has recently been advocated by some as primary therapy in the treatment of glaucoma, especially for those patients who have contraindications to glaucoma medications or, for any reason, are unable to use eye drops. In the ALT procedure, the eye surgeon directs a laser beam into the trabecular meshwork, which is the primary aqueous (fluid) drainage region of the eye. The trabecular meshwork is located in the angle of the eye, approximately where the cornea meets the iris . In most cases, 180 degrees of the trabecular meshwork is treated with laser spots, which typically requires about 40 to 80 laser applications. The effect of the procedure is increased drainage of aqueous fluid out of the eye, thereby lowering the intraocular pressure. The ALT procedure can be completed as an out-patient procedure. The procedure is completed with the patient seated at the laser, with topical (eye drop) anesthesia, and a lens applied to the surface of the eye to allow delivery of laser applications into the trabecular meshwork . This procedure is typically painless or results in only minor discomfort. After the procedure, the patient is typically treated with anti-inflammatory eye drops for a few days, perhaps in association with their usual glaucoma medications. Vision is minimally, if at all, affected, even on the day of the procedure. There is generally no discomfort after the procedure. Most patients are scheduled for a return visit within a week to re-evaluate. Glaucoma drainage devices, also known as tube shunts, are implanted devices that are designed to maintain an artificial drainage pathway for patients with glaucoma . This procedure is often chosen for patients at high risk of failure with a traditional glaucoma filter procedure (trabeculectomy). Such patients might include those with neovascular glaucoma , glaucoma associated with uveitis (iritis), prior history of failure with a filter procedure, and any patient with glaucoma under 30 years of age. All of these patients are at significant risk for failure of a routine glaucoma filter procedure due to greater inflammation and fibrosis (scarring), which might close off the drainage canal . Prior to surgery, your ophthalmologist may have you take eye drop medications to prepare your eye for surgery. These may be begun on the day of surgery, or even up to 3 days prior to surgery. Just prior to surgery, local anesthesia will typically be given to numb your eye for surgery. In young children, the procedure must be performed under general anesthesia. Just prior to surgery, a local anesthetic is usually given unless the procedure is to be performed under general anesthesia. Your eye will be prepped in the operating room and sterile drapes placed to maintain a sterile field. An operating microscope will be moved into place. The surgeon will place a small instrument to hold the lids apart during the surgery. A small incision is made in the conjunctiva , usually towards the top of the eye, however, the surgery may be performed in other quadrants of the eye. The surgeon will then make a tiny incision in the sclera of the eye and will fashion an opening for the drainage implant device. The drainage tube will be placed such that the opening of the tiny tube is inside the anterior chamber of the eye where it is bathed in aqueous fluid. The tube is sutured in place with the drainage device attached to the sclera of the eye. Most surgeons will place an absorbable suture around the tube at the time of surgery to prevent filtration through the device until a fibrous capsule has formed. As such, the device is not expected to function until about 3 to 8 weeks following the procedure. This technique is thought to prevent over-filtration. Once the tube shunt is securely sutured into the desired position, the conjunctiva over the device is closed with tiny sutures, which are considerably finer than human hair. As previously stated, the tube shunt device is not expected to function until 3 to 8 weeks following surgery. In the meantime, the glaucoma may be even more difficult to control than before. 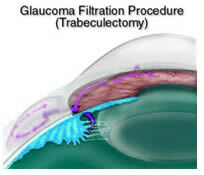 Some surgeons, therefore, create a separate glaucoma filtration site, which is expected to fail at approximately the same time that the tube shunt begins to function. You will be instructed to use antibiotics , anti-inflammatory medicines, and probably glaucoma medications following the procedure. The actual medicines and dosing schedules will be carefully planned and reviewed with you by your eye surgeon or his staff. You may expect to use these additional medicines for up to two to three months after surgery to help prevent infection and control inflammation. In general, you will likely be able to return to most activities within a day or two after surgery. Your eye may feel scratchy or have a foreign body sensation. This should usually resolve in the first one to two weeks. Your surgeon will instruct you as to strenuous activities. When Can I Expect the Final Results? The efficacy of the tube shunt implantation usually won't be known until at least 8 to 12 weeks after surgery or more. At that time, a new baseline level of pressure within your eye will usually be established. Will My Glaucoma Be Cured with the Tube Shunt Device? In general, glaucoma cannot be reversed. The damage which has ensued prior to surgery is essentially irreversible, since the optic nerve does not regenerate. The best result that can be expected is a complete halt of the progression of glaucoma. This can only be known by following visual signs of the optic nerve and evaluating peripheral vision with visual field testing . What are the Risks with a Tube Shunt Device? The risks of this procedure include, but are not limited to, over-filtration (pressure too low in the eye), under-filtration (pressure remains too high in the eye), infection, bleeding, swelling of the retina , fluid under the retina (choroidal detachment), droopy eyelid, double vision, loss of vision, and even loss of the eye. In general, however, if your surgeon recommends a tube shunt implantation, he or she believes the benefits of the procedure far outweigh the potential risks. Will I Still Need Medications After a Tube Shunt? All patients will need eye drop medications to help prevent infection and inflammation after a tube shunt implantation, usually for the first two to three months. After that, use of glaucoma medications to further control pressures will depend on the outcome of surgery, i.e., the pressure in the eye. When glaucoma continues to progress despite the use of medication regimens and possibly laser treatments, a glaucoma filtration procedure (trabeculectomy) may be recommended. In general, a glaucoma filtration procedure is recommended when these other methods of glaucoma management have failed or have insufficiently controlled the progression of glaucoma. However, in some cases, a glaucoma filtration procedure may be recommended before other methods of treatment are attempted. This decision is based on the type of glaucoma, the degree that it has advanced, the general health of the patient and ability to comply with treatment regimens, and other circumstances. In a smaller proportion of patients, the glaucoma filtration procedure is combined with a cataract operation. Once the decision is made to proceed with a glaucoma filtration procedure, the surgery is scheduled. The procedure is completed in the operating room, usually under local anesthesia. Some ophthalmologists will complete the procedure under topical (eye drop) anesthesia. On the day of surgery, one should expect to have several eye drop medications applied multiple times to the eye for approximately one hour prior to the procedure. Finally, the eye drop anesthetics or local anesthetic is applied just prior to the procedure. Once in the operating room, your eye will be “prepped” for surgery with sterilizing solutions. Usually, a semi-opaque sterile drape will be applied over the operative field, using a small instrument to hold your lids apart for the procedure. Your eye should be entirely comfortable during the operation. Your surgeon may recommend mild sedation during the procedure, and this is usually determined on a case-by-case basis. The goal of the glaucoma filtration procedure is to create a new passageway by which aqueous fluid inside the eye can escape, thereby lowering the pressure. The escape route, however, is not directly to the external surface of the eye, as this would obviously allow access for bacteria inside the eye and thus, potential infection. The filter, therefore, allows the drainage of fluid from inside the anterior chamber of the eye to a “pocket” created between the conjunctiva , which is the outermost covering of the eye, and the sclera , which is the underlying white anatomical structure of the eye. The fluid is eventually absorbed by blood vessels. In many cases, medication to control scarring, and thus to help prevent closure of the filtration site, is applied to the eye during the operation or just afterwards. These medications, known as Mitomycin C and 5-Fluorouracil (5-FU), will be used in some cases and not others, depending on both surgeon and patient variables. In most cases, a patch and shield will be placed over your eye on the day of surgery. This is usually removed later that day or the day after surgery and eye drop medications are begun. Your surgeon will usually want to evaluate your eye on the day of surgery or on the first post-operative day. At that time, depending on pressure in the eye, your surgeon might elect to cut sutures on the flap of the filter to modulate the filtration process. This is often done with a laser while in the office. Antibiotic and anti-inflammatory eye drop medications are continued after surgery for up to 6 weeks or more. In some cases, the surgeon will apply additional medicines (e.g., 5-FU) to further prevent scarring and failure of the filter. The exact regimen will vary from one surgeon to another as well as surgical outcome variables. Cutting of sutures may be completed up to several weeks after surgery, again depending on the degree of filtration noted at each office visit. The number of visits to your doctor after surgery may vary widely depending on circumstances. In general, follow-up visits after filtration procedures are quite frequent, as often as every day or two shortly after surgery, with office visits decreasing in frequency as healing progresses. Can glaucoma be cured with filtration surgery? In general, glaucoma is rarely cured, but the progression of the disease may be greatly delayed with surgery, medicine, or laser procedures. If your surgeon has recommended a glaucoma filtration procedure, it is quite likely that your glaucoma is moderately or severely advanced. The goal of this procedure is to preserve your vision. This is usually, but not always, possible. Does surgery eliminate the need for medication? You will certainly need medications after surgery, perhaps for the first 4 to 10 weeks. After the filter site of your eye has entirely healed, whether you will need glaucoma medications will depend largely on the pressure in your eye as well as your peripheral vision (based on a visual field test). In most cases, dependence on glaucoma medication is reduced, and in some cases, glaucoma medications are no longer required. Your eye surgeon will determine whether medicines are appropriate or not based on your final outcome with surgery. Is there still pressure in the eye after surgery? Yes. However, after a glaucoma filtration procedure, the pressure may be too low or too high, depending on the degree of filtration. Your surgeon will use many techniques as well as medicines to modulate this effect after surgery. Once healing is complete, usually 6 to 8 weeks after surgery, a new “baseline” pressure is usually established based on the degree of filtration created by the combination of the surgery and subsequent healing. Does a filter procedure have risks? All surgical procedures have risks. Glaucoma surgery is no different. The primary risks include, but are not limited to, infection, bleeding, swelling in the retina , development of fluid under the retina ( choroidal detachment ), retinal detachment, droopy eyelid, double vision, loss of vision, and even loss of the eye. The likelihood of these risks is quite low, but you should discuss the risks, as well as the benefits of the procedure, with your surgeon. In general, if your eye surgeon recommends a glaucoma filter procedure for you, he or she believes that the potential benefits of the procedure far outweigh the potential risks. 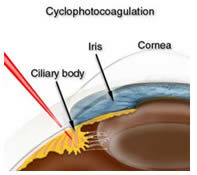 Transscleral cyclophotocoagulation is a procedure for glaucoma that is performed on an outpatient basis. In this procedure, the ciliary body of the eye, which creates aqueous fluid, is treated with laser to decrease production of aqueous. This in turn reduces pressure inside the eye. The technology has been available for nearly 30 years. The cyclophotocoagulation procedure is usually performed with local anesthesia. About 20 to 40 laser delivery applications are completed. After the procedure, the patient is usually started on both dilating and anti-inflammatory eye drop medications, and perhaps oral anti-inflammatory medications as well. Cyclophotocoagulation is most often employed when other means of glaucoma treatment have failed to properly control high pressures. Many patients will require more than a single treatment. The procedure appears to have significant success and relatively low risk.